Sometimes the first steps are the hardest, and that certainly seems to describe Frodo's dilemma. Now that the conclusion has been drawn that he must take the ring away from the Shire, he drags his feet in making plans and preparations. After several weeks Gandalf pushes Frodo to make solid plans, with an agreed on leaving date on his 50th birthday, several months away. Turns out I made a mistake in chapter two, I read it as his 50th birthday had passed, not that it was still approaching. While Gandalf accepts the date, he is quite adamant that Frodo and Samwise leave no later than September 22nd. Taking care to not cause gossip is important, but they are now running against the clock. 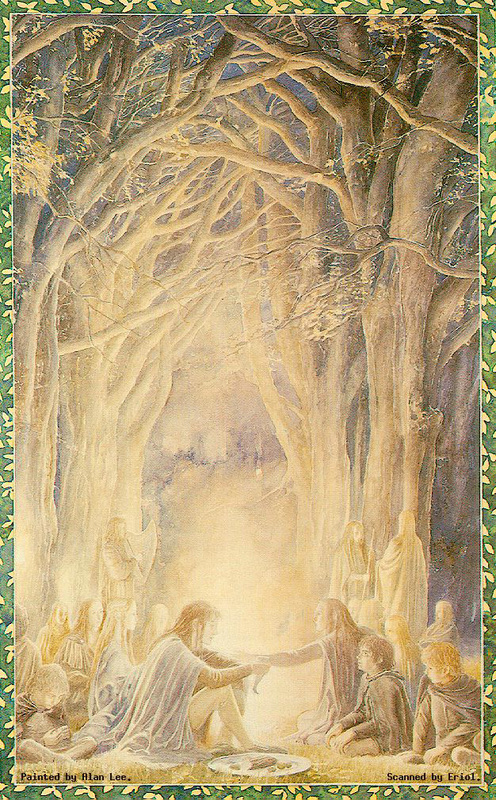 Of course, it's not just a matter of leaving, but having a place to go, and to where else but Rivendell? Now there's a location both Frodo and Sam can look forward to visiting, and one that serves Gandalf's purposes well. I think it's particularly interesting that Gandalf comments on the growing peril of the journey. True, in The Hobbit, Bilbo and company encounter the trolls, but that was considered an oddity, and on the journey home there were no dangers between Rivendell and the Shire. Now the journey through civilization to the Last Homely House is marked as dangerous enough to make note of it. None of them want gossip about Frodo leaving, at least leaving the Shire. With an enemy at large seeking the ring, the last thing they want to do is to bring attention to their journey. That being said, they definitely create quite a stir about Frodo's relocation within the Shire. The selling of Bag End to Lobelia Sackville-Baggins probably caused nearly as much gossip as Bilbo's return from presumed death regardless of the rather sensible reason of moving to a smaller home out near his extended family. If you're only familiar with the film, much of this chapter is going to seem completely out of left field. For the most part, this chapter is completely excised from the movie. Honestly, as someone who has read the books several times many of the details slip through my memory. More than anything the plot involving Frodo moving to Crickhollow, accompanied by Sam as a gardner, serves to show quite how large the Shire is, something that I've never gotten from either the movies or The Hobbit. Several months after Gandalf has left, with no word despite his promises to return, Frodo turns fifty and walks from Hobbiton to Bucklebury Ferry with Samwise and Pippin. The excuse of being tired of nosy neighbors works well, as Frodo has reason to feel that beyond the Ring. The arrival of a mysterious black cloaked rider questioning the Gaffer about a Mr. Baggins just makes the caution all the more called for. The journey isn't all darkness and hinted at dread. A little aside concerning a fox most puzzled and amused by the camping hobbits makes for a moment of levity up against the dreadful and compelling encounters with the black rider along the road. And something is certainly in the air, with the same song coming to Frodo as did to Bilbo, about the journey on the road. Perhaps this lends credence to Gandalf's belief that there are forces beyond that of the Ring and Sauron at work in the matter at hand. Their meeting with the elves also hints at forces beyond that of simple chance. Not just any elves, but high elves by their singing of Elbereth, their silver light and silver voices banishing the black rider as if it never was. In fact their mien is one of teasing, similar to the music of the elves at Rivendell in The Hobbit, until Pippin's mention of the black rider catches them off guard and sombers their mood. Gildor knows something of what lies ahead of Frodo, even if he does not know in full what Frodo bears with him that very moment. It's hard to tell exactly what he knows and does not, with the games that elves play to hide their knowledge. We do know that news of Gandalf's absence was unknown to them before, and upsetting to learn now, and while he will not share fully, we know that certain terror lies ahead. The elves provide more than just respite. They help us connect our starting story to the world and history at large. The Hobbit involved events with wider impact, but the focus was narrow. The scope of The Lord of the Rings is drastically wider. I like this reflection on advice, it's a good piece to reflect on. Of course, even with that and without knowing the full details Gildor does give advice to Frodo. Advice that closely mirrors the words of Gandalf, both in general and in reflection of hobbits. "Courage is found in unlikely places." For the most part very little of this chapter makes it into the movie. Gandalf starts Frodo and Sam on the road immediately, with no time set aside dawdling, let alone selling Bag End and making a show of moving across the Shire. Pippin (and Merry) won't come into play until later on, and the elves are completely absent. We will get the black rider, sniffing for the Ring, and Frodo's overwhelming compulsion to put the Ring on, but again, not until later. I like how they do it, but it won't be slotted in until further in their journey. Gandalf does go missing, leaving to meet with Saruman immediately after setting the two hobbits on their journey. For the most part I'm going to leave this passage aside, as I think we'll partially come back to it later on. But I really like what they did in terms of lighting and set design here. The strong contrasts make for some visually stunning moments with Saruman throughout the film, one of the things that stuck with me after the theater all those years ago. Putting Gandalf's conflict here makes sense, removing the need for exposition later on to explain his absence, in addition to ramping up the overall tension.